The Ministry of Education, Youth, and Sport (MoEYS) introduced a phonics approach to teaching and learning the Khmer language in primary schools in Cambodia in 2012. To support the MoEYS in improving the reading competencies of early grade children, World Education, Inc. (WEI) was awarded a two-year, USD $300,000 grant under the All Children Reading: A Grand Challenge for Development (ACR GCD) Round 1 global competition to implement the Total Reading Approach for Children (TRAC) project in eight primary schools in two provinces in Cambodia between October 2012 and September 2014. Based on preliminary evidence of promising results, and building upon the ACR GCD partners’ interest in scaling promising interventions, World Vision International-Cambodia (WVI-C) directly funded WEI between December 2014 and September 2017 to expand the Total Reading Approach for Children Plus (TRAC+) project to 138 primary schools in five provinces. 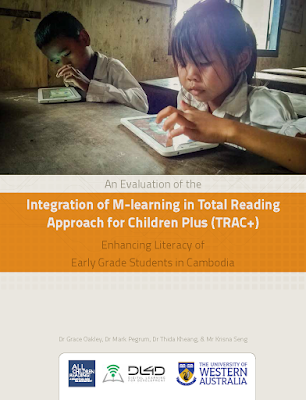 This study was conducted to evaluate the effectiveness and efficiency of the mobile learning (m-learning) component of the WEI-implemented TRAC+ project. It focused on the value of the Aan Khmer (“Read Khmer”) app—one of the few mobile solutions awarded under the ACR GCD Round 1 global competition that sought to offer digital gaming to early grade students in low resources settings—as a means of improving the reading of children in Grades 1, 2, and 3. The University of Western Australia, 2018.